It has been awhile since I’ve written anything on this blog. I guess it is because I’m feeling a bit lost as to my own relevance with the role of being a “working mother”. This is because of the divorce and shared physical custody. The first half of my week I am a “worker” without kids, and the second half of my week I am a stay-at-home mom. So, I really am not faced with the day to day challenges that “real” working mothers experience. Until this week. Co-parent is on a work trip and I have the kids all week. It feels like a gift to me. I’ve been smiling most of today and I feel so much stronger now that my kiddos are with me. So, I feel the need to write. I woke up earlier than usual to get the routine going while the kids still slept. I showered the night before so getting myself ready was a snap. I took the opportunity to start my coffee, change a load of laundry, and start to pack Big Bro’s lunch. Twin Crazy woke up first. We had a fight the night before because of her not wanting to go to bed. She lost dessert tonight. So we talked about that and I told her that I still loved her even though I was mad at her. She hugged me hard. It was just me and her for a long time this morning. Chocolate Tuesday. And her stuffed animal duck which she was caring for, kissing, and making sit up to look at her. She kept me company as I continued to pack Big Bro’s lunch. Twin Husky was up next. He was confused about the day of the week. 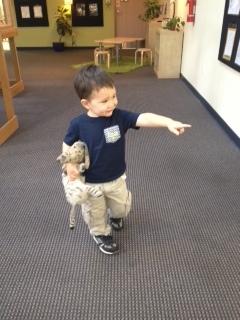 He didn’t realize it was a school day and went over to the couch to lay down and cuddle with his Tiger. I held him in my lap (I LOVED that part!) and explained Chocolate Tuesday but he wanted a breakfast bar “on the road” just like his big brother does. So I worked with him to get dressed instead. He is really liking pants/shorts with pockets so I had them ready. We counted the pockets and he had fun putting his stuff in his pockets. Red was up next and sleepy (due to Twin Crazy keeping her up last night). I sat with her on the couch, again her on my lap (I LOVED this part!) and held her until she woke up more. She was smiling for Chocolate Tuesday. 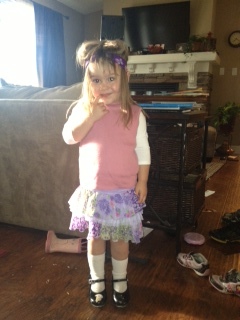 Twin Crazy went off to get changed by herself and she picked out a skirt because she “wants to look pretty”. Lately she is picking out multiple shirts, multiple underwear, multiple shorts, multiple socks. She often looks silly but I encourage her creativity and love of clothes. Today she surprised me with a headband and tap-dance shoes. Her hair was all over the place with the headband and she actually looked like a muffin-head. She looked ridiculous but also adorable. Twin Crazy had a screaming incident due to too many shirts on. I ran in to get one shirt off. At the same time, Red started screaming about a spider. I then ran with Twin Crazy’s shirt and smashed the spider. I was out of breath and exaggerating the whole scene as I shook the spider from the shirt at the back porch. The kids were giggling. Twin Husky was excited to be holding a breakfast bar for the ride like his big brother. Kids were great getting dressed and shoes on. Big Bro woke up quickly and got out quickly, breakfast bar in hand. As I walked outside another spider was caught onto me from its web. So I was busy dancing and swatting outside of my house while all the kids were in the car waiting. Again, they were giggling at me. I had so much fun. I watered parts of my garden before leaving. Some of my sprinkers need to be adjusted. On the way we talked about the funny morning, the breakfast bars, the night before and how the girls did not want to go to sleep, Twin Husky’s pockets, garbage trucks, how the hills are starting to turn brown because of the sun, and how I was likely going to be late for the ferry and therefore have to work at Starbucks. Big Bro quickly requested hot chocolate for the pick up, with whipped cream. Unbelievable. Big Bro was on time. Drop offs for Red, Twin Crazy, and Twin Husky were great. Twin Husky was clingy, but got through it. I drove to Starbucks with a HUGE smile on my face. I love being their mother. I love these kids and how we make each other laugh. I love how they will be waiting for me to pick them up. 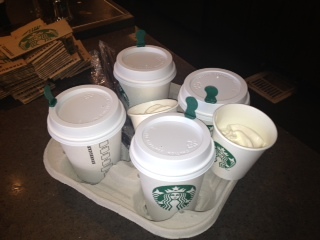 And yes, I will get hot chocolate for them to divide and share on the long commute home. Got set up at Starbucks with a plug for my computer AND a plug for my phone. Figured out billing/invoicing for one of the big meetings that just passed. Called speakers to personally thank them for attending and speaking at the meetings that just passed. Did other administrative things that needed to get done. I decided to pack up and get the kids a bit early. I grabbed a large hot chocolate divided into 4 little cups with some whipped cream on the side. I knew the kids would be psyched. It was a great, productive work day. There was lots of discussion about hot chocolate on the way home. There was some discussion on who was saving theirs, drinking theirs the longest, not drinking at all and saving for dessert since the girls were not getting dessert tonight from me (bad behavior from the night before), how we could make hot chocolate at home, etc. Twin Crazy was singing particularly loud on the way home. I saw Big Bro swat Twin Husky from the rear-view mirror so he got a 7 minute “rest time” in his room when we got back. Then Twin Crazy was showing some attitude so she got 3 minutes. I even think Twin Husky was banished for 3 minutes for something. Afterwards, Big Bro sat with me in the kitchen while I cooked dinner. We listened to music. He does not like U2’s “zoo station”. I went to the garden to pick stuff for dinner. Kale, sweet peas, herbs. I picked a broccoli leaf for Cocoa. I had to chase a chicken from next door out of my garden yard. It kept running into the deer netting that I put up which made me laugh. 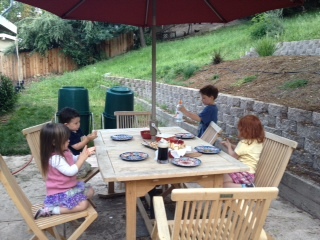 The rest of the kids were playing with forts, and also hand-me-down “Lincoln logs” that we got from a friend. They were all busy building and using their imaginations. There were little fights but it was manageable. 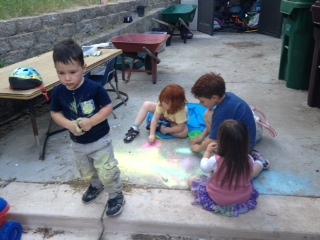 Big Bro joined the fun with side walk chalk. 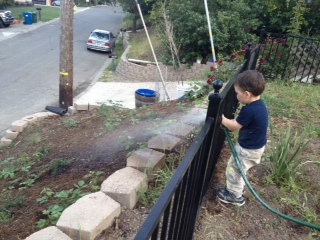 Twin Husky wanted to water the garden but I got him to water my newly planted bushes in the front yard instead. He looked so happy. He came in when he was done and even said that he turned the water off by himself (he did, succesfully). We ate dinner outside and loved it. They all ate well. 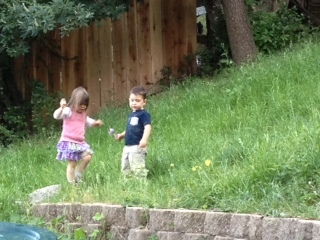 Twin Crazy and Twin Husky decided to go and pick “flowers” (weeds). After dinner I sat with Big Bro so he could finish his homework. 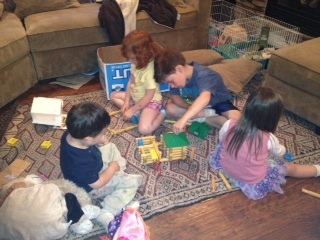 The rest of the kids were playing Lincoln logs. Time for bed happened on-time tonight; little ones went down relatively easily; Twin Crazy was a bit scared about alligators but stayed in her room. Twin Husky kept coming out for water. It was hot and he asked for a wet paper towel for his back (I do that instead of air conditioning). He then asked for two more for his two Tigers. Talk time with Red and Big Bro was fun. 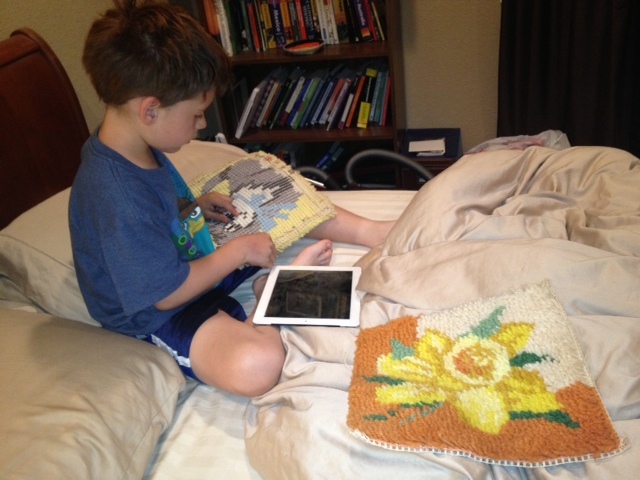 We also received a “latch hook” set from our neighbors and I showed them two sets that I did as a kid. Believe it or not, my mom sent them to me when I turned 40. The kids were interested in my projects as a kid. Big Bro said that he would show these to his kids someday and then started to pretend that he had kids, showing them my latch hook projects and then telling them to go to bed, laughing. He cracks me up. We talked about birthdays and the unopened Amazon box in my room. That kid knew it was the Lego sets that I bought for him for his birthday and he was jumping up and down. We talked about mosquitoes for a bit. I gave the older ones piggy-back-rides to their beds; Red tried to ask me who was my “favorite” out of all the kids but I kept skirting her question. They are all asleep now, I am showered to get a jump start on tomorrow, and am feeling great. I loved today. The entire day was a gift to me. I don’t usually have this much time with them. I survived getting four kids in / out and working and going through long commutes on two highways. I feel lucky that I have a job that can offer me so much flexibility and the ability to work out of office at the last minute. I feel lucky that I have families that support us and think of us – we appreciate all that they give. I feel lucky to have this home where we can eat outside, eat the food that the garden provides to us, and gives the kids a chance to explore the yard and pick flowers. I feel lucky that I have reminders from my past that the kids are interested in them – they are getting to know me in new and different ways. 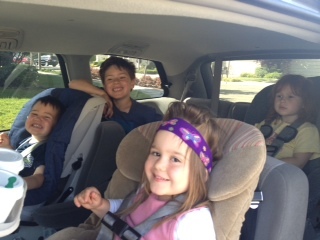 But most of all I feel lucky to have four little pumpkins/monkeys/sweeties in my life. I can’t get enough of them!! !